Bruce Smith (2): Percussion and background vocals. They were all born in Portland, Oregon, and had known each other since they were kids. The band had been playing together since early 1972 and were discovered at a club in Portland by Wayne Henderson (Trombonist, writer and producer of Crusaders) who brought them to Fantasy Records in 1974. 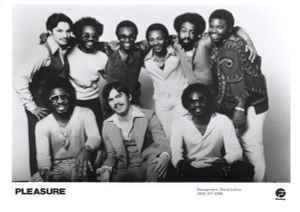 This was the beginning of a six year relationship with the label and a four year relationship with Wayne Henderson who, through his own production company "At Home Productions", was the band's producer and mentor. Pleasure was a very versatile band. Their music can best be described as a fusion of jazz and rock, soul, funk and R&B. Very distinctive, funky and definitely danceable.The group disbanded in the early 1980's.